Pulses of light only one-quintillionth of a second long are to image the motion of an electron as a first step to understanding electron behaviour to enable petahertz superconducting computing. Computers operate at the speed of gigahertz, a billion cycles a second, but a better understanding of electron behaviour could see computation increased a million times to the speed of petahertz, a million billion cycles per second. Gigahertz technology uses silicon, but graphene is a candidate material to replace silicon for computing. Graphene can be a superconductor and understanding how the electron moves through graphene will help in the development of nanoscale graphene electronics, which could achieve petahertz speeds. “This [imaging] opens the door to controlling electron motion in solid state and maybe do optical switches which can turn on and off the current using light speed with femtosecond or attosecond resolution, so we are talking about petahertz speed, one million times faster than the current technology,” says Mohammed Hassan, an assistant professor of physics and optical sciences at the University of Arizona. The electron that is imaged will be generated by photon emissions that will produce a number of electrons which can be monitored for the duration of a few hundred attoseconds. Hassan has developed a light field synthesizer apparatus that generated an optical attosecond pulse. Using this attosecond pulse, he was able to measure the time an electron takes to respond to an external light field. The next step is to use the attosecond electron imaging facility for capturing images of electron motion in real time. The electrons will be imaged inside atoms, molecules and solid state materials. Hassan sees the potential to not just image the electrons but to control the electron motion using an attosecond laser. The imaging will enable scientists to understand electron trajectories in materials and Hassan wants to find out how the electron moves in systems like graphene. With this knowledge he thinks that nanometre scale optical computing graphene devices powered by ultrafast laser pulses could be designed. Such a device would operate at petahertz speeds. Researchers at the Massachusetts Institute of Technology have discovered that twisted graphene is a superconductor. 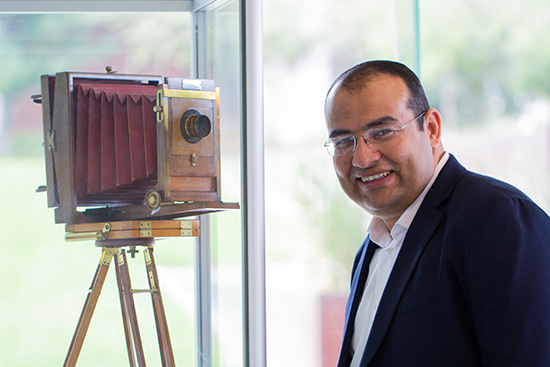 Hassan wants to use his imaging technology to understand why twisted graphene is a superconductor. Of particular interest is two-dimensional graphene. A 2D material is a single layer of atoms of an element and has applications for optical computing because 2D graphene in electronics can absorb light efficiently. Coupled with a 2D photonic crystal, such a device could emit light efficiently also. For the work, Hassan has received a three-year, $450,000 United States Air Force Office of Scientific Research Young Investigator Research Program grant and a two-year $1.3 million Gordon and Betty Moore Foundation research investigator award. 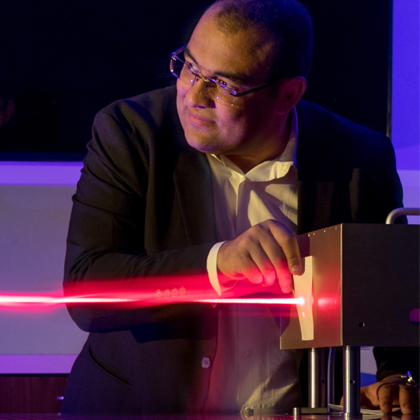 Hassan expects to carry out the first experiment in 2021 after constructing the attosecond microscopy diffraction tool needed.